Face Painting is an enjoyable form of entertainment. People have a lot of fun getting painted and they enjoy watching! 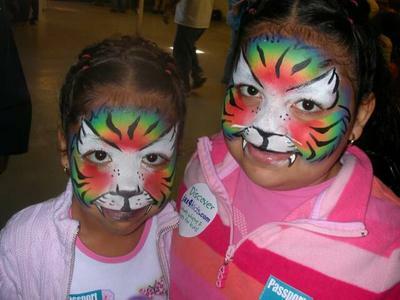 But that's not all we offer... you can mix and match, face painting, balloon art and temporary glitter tattoos. We are available for all types of events; private parties to corporate events, grand openings, festivals and more. Our service area includes Jacksonville, FL and Statesboro, Savannah, GA.
We use only water-based FDA compliant as a cosmetic face paints and cosmetic glitters that wash off with mild soap and water. What this means to you, is that we do not use any type of craft glitter, acrylic paints or other paints which are not meant for the skin. 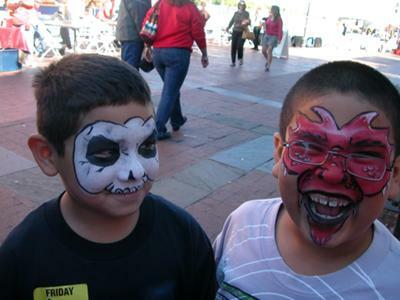 Face paint is basically a vibrant make-up that is safe for use on the skin. 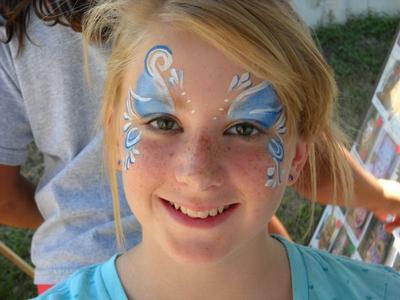 We can paint approximately 10 faces an hour, depending on the complexity of the design. Get in touch early for the best selection of available dates.